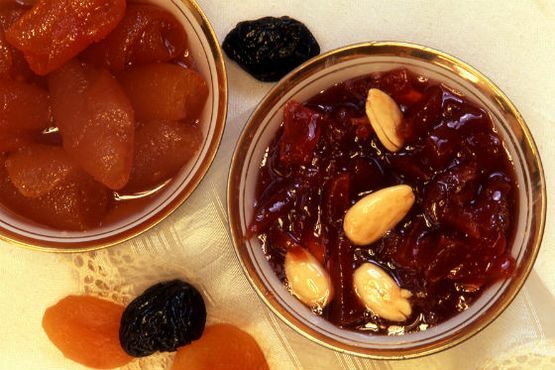 Aunt Asimina used to make sweet and sour cherries from the trees she had in her yard while grandmother Elenitsa was a specialist in making sweet grape with lots of almonds. The serving of this particular type of sweets in the 50′s was still a ritual. The jars with the sweets of various fruit were locked in a closet away from the reach of children of the house. The jars appeared whenever there were visitors at home. The “spoon sweet” was served in a special jar with spoons hanging from its neck. 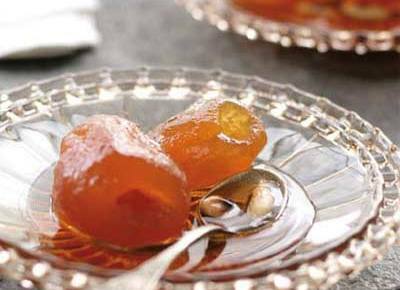 Each visitor would take a spoonful of the sweet straight from the jar and serve it on a special crystal plate. Probably the name of this sweet comes from this particular procedure.